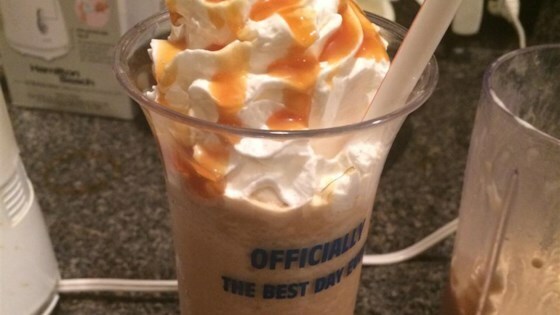 "This is my copycat version of the popular Starbucks Caramel Frappuccino®! Top each glass with whipped cream and drizzle additional caramel over the whipped cream. Serve with a straw. Leftovers keep well in the refrigerator!" A frosty blended drink that will remind you of campfire s'mores. I made strong coffee with 2 tablespoons of ground coffee beans per cup in the coffee maker. Delicious! I used Starbucks Kcup and tasted just like it! I honestly don't know how anyone used this exact recipe and got a "perfect" frapp. Mine was a frothy Carmel milk.ff. I loved this! I used Truvia instead of sugar and skim milk, which turned this into a Caramel Frappuccino Light. My newest addiction! Delish!! If you add vanilla ice cream!!! To die for! !